Helping is a continuous process and does not know time and place. We extend help in any way we can. As runners, we have built a reputation of being ONE when the opportunity comes for us to help. 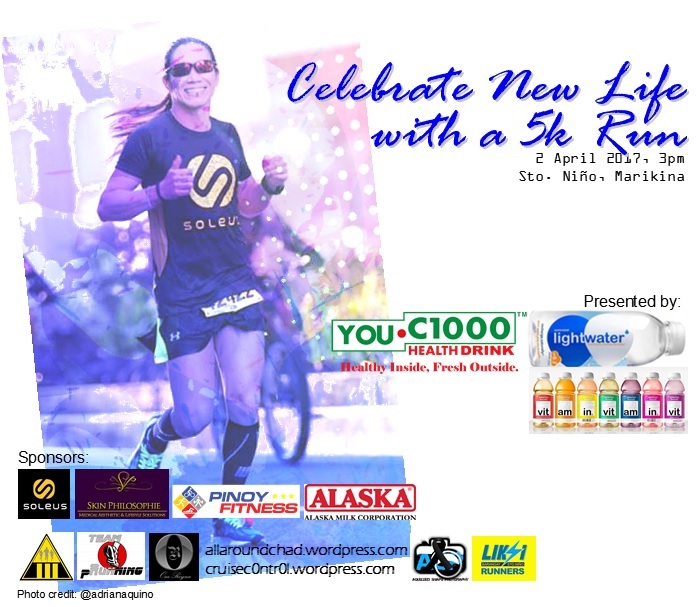 This January 26, 2014, Pinoy Aspiring Runners (PAR) is inviting you to join a run for a cause for the benefit of the elderly housed at ANAWIM (Home of the Abandoned Elderly). *Fees are inclusive of singlet and medal. Let’s run together to make a difference. Now on its fourth year, Alaska IronKids brings junior triathletes 6 to 14 years to the historic Cebu for the Alaska IronKids Triathlon. 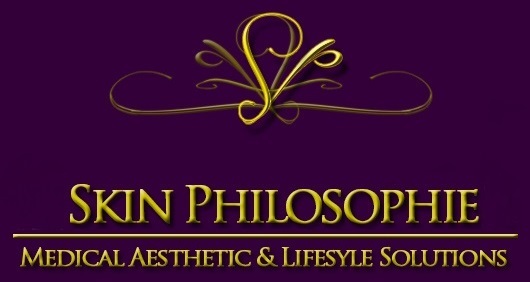 The event is taking place at Shangri – La Mactan Hotel Beach Front on August 3, 2013. Considered to be one of local junior sports’ most prestigious races, Alaska IronKids Triathlon is the local franchise of the internal IronKids Series, which has many notable alumni including Olympians Hunter Kemper and Nick Radkewich, Laura Reback and Douglas Mosiniak, Jr. The multi-sport event tests the children’s skill, discipline and endurance in swimming, biking and running. The race is divided into girls and boys division, categorised according to the following age brackets: 6-8 years old, 9-10 years old, 11-12 years old and 13-14 years old. All finishers receive a specially crafted finisher’s medal. Will this year bring more participants to surpass last year’s attendance of 134 participants? Registration is already on going for young local and internal triathletes. As of press time, a total of 165 participants have already registered. This year’s event highlights the participation of Borlain Sisters, Ildefonso Sisters, the Pangilinan Siblings, and the McCormack Sisters. On the front end to defend her title is consistent top finisher and Alaska Milk Ambassador Tara Borlain, who at 10 years old, has remained unbeatable. Also expected to top in their respective race category are 2012 top winners Syrah Ruth Uy and Eric Almendral who dominated the 6-8 year old category; Juris Aaron Tan in the 9-10 year old category; Lauren Justine Plaza and Yuan Chiongbian in the 11-12 years old group. Let’s see who makes the cut in the top three spots for the 13-14 years old category. Alaska IronKids is part of Alaska Milk Corporation’s advocacy campaign “Nutrion. Action. Champion.”, which highlights the importance of nutrition and sports in the physical, mental and emotional development of the children. The campaign is very timely due to the fact that two out of 10 Filipino children below 10 years old are found to be overweight, while three out of 10 children are found undernourished in the latest survey of the Department of Science and Technology’s Food and Nutrition Research Institute (DOST-FNRI). Since its launch in 2010, Alaska IronKids has become a symbol for active and healthy lifestyle among children. Its successful races have encouraged children to take care of their bodies through exercise and balanced diet, and have instilled the values of determination, hard work, teamwork, discipline and sportsmanship. 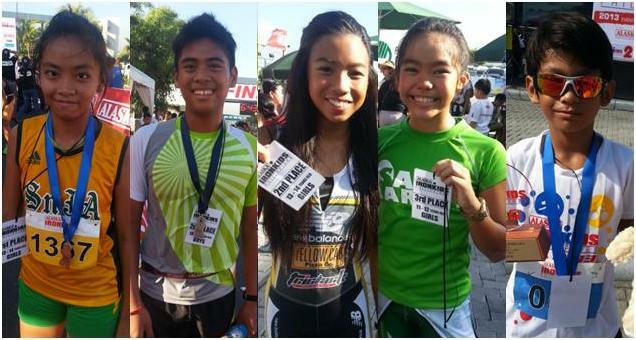 Alaska IronKids has mounted four races to date: Run races at UP Diliman Track Oval and Mall of Asia, Aquathlon at Ateneo de Manila Grade School, and Swimming competition at Marist School Marikina. To cap off this year’s races, another triathlon is scheduled on October 20 at Palms Country Club in Alabang. A couple of weeks after the Aquathlon Event, on June 1, 2013, Alaska Ironkids staged yet another exciting and action – packed event, the Alaska Ironkids Run Race. The event was held at SM MOA, where a total of 125 aspiring young triathletes competed in Individual and Mixed Relay categories. The venue had a perky ambiance as the tri – kids gathered up, waiting for their respective race briefing and gun start schedules. Race Director Coach Ani de Leon- Brown, was very hands on during the entire event – from conducting the race briefing and leading the stretching exercises, making sure that the kids are well informed of what to do when it’s their turn to race. She would act as second mom to the kids as soon as they have left off the start line. Like the usual fun run, there were participants who were recreational runners, and there were others who raced to win. Half an hour before the first wave of runners set off from the starting line, you can see some of the junior triathletes already doing their warm up run. A secretariat booth was provided for those who have not claimed their race kits yet. An Alaska booth was set up where all participants, parents and visitors alike can have their fill of the nutritious and refreshing Alaska milk, which came in two variants – the classic vanilla and the chocolate flavored. Personally, I love the chocolate flavor. And in celebration of the World Milk Day, there was a photo booth where you can have your photo taken with a milk moustache on. Check out the photo gallery at www.facebook.com/worldmilkdayph. Also, ample hydration and bananas were provided for all the participants. Photos (from left): 1. Alaska Ironkids getting ready for their race category. 2. Coach Ani leading the stretching. 3. Teammates Isabelle Rivera and First Place winner Tara Borlain. 4. Ironkid showing support for the World Milk Day. By 6:30am, participants in the individual categories were set off in waves, according to the age group that they belong to. And who says the race is just for the normal kids? There were a couple of young racers who had special needs, and they have completed their respective race categories! Being a mom herself, it was very heartwarming to see Coach Ani personally assisting these kids after they crossed the finish line. In about two hours, all the participants have done their respective races. And she even was still full of energy during the awarding ceremony! And it was time to recognize the cream of the crop! 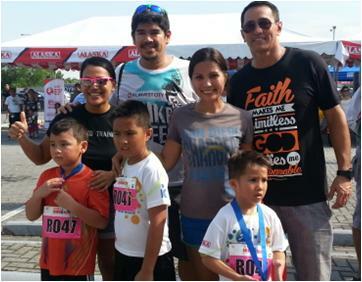 Mom Patricia Hizon, shared that although “the kids have been participating in the Ironkids events, it is their first time (for the Hizon kids) to join in the relay category.” Former basketball superstar Vince Hizon was also at the event to provide support to the children. The top three winners each received a medal, a signature teddy bear and a loot bag from Alaska. All participants who have completed their respective race distance received a finisher’s shirt and a finisher’s medal. For safety and security purposes, event marshals and Emergency Response Teams were deployed in strategic locations along the race route and at the venue. 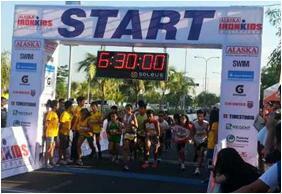 Alaska is presenting another installment to the Alaska Ironkids, the Aquathlon event scheduled on June 30, 2013. To register, please log on to www.ironkidsphil.com. For race results and updates, please visit www.ironkidsphil.com. For information on Alaska Sports program, please visit www.alaskamilk.com.ph. Also, please follow us on Twitter @AlaskaSportshub. 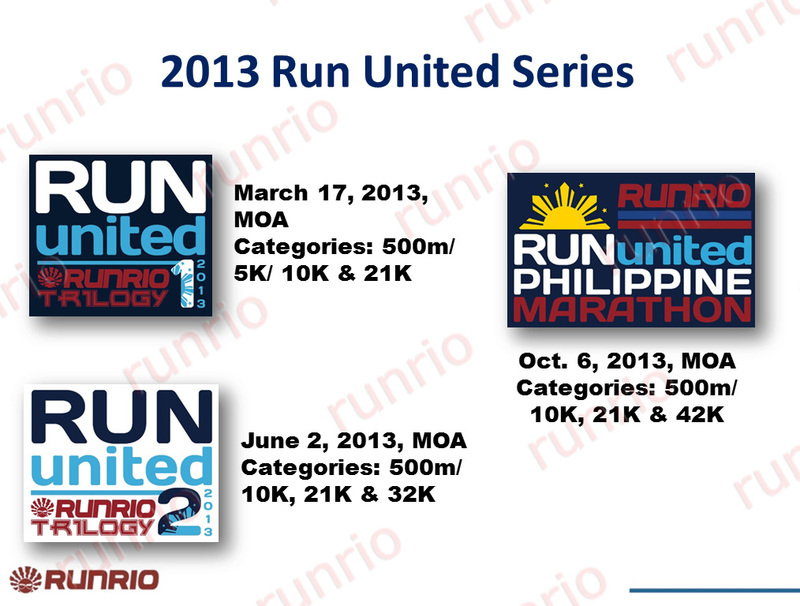 Runrio, Inc. has finally released the teaser for the 2013 Runrio Trilogy – The Run United Series. In 2012, Run United came out with four races: Run United 1, 2, 3 and the Philippine Marathon, with the longest distance of 21k in both Legs 1 and 2, 32k for Leg 3, and 42k for RUPM. This year, with the inclusion of the Philippine Marathon in the series, the longest distance for each leg are: RU1 – 21k, RU2 (known as the Afroman Challenge): 32k, and RUPM: 42k. That being said, registration dates and race dates have already been released as early as now to give the runners ample time to plan their weekend races ahead of time. Now that the race schedules and registration fees have been made public, I won’t be surprised if various reactions would surface stemming out from the not-so-practical registration fees involved in the Run United series. If you have been a participant of these races in the past, you would say that the experience you have had is worth the money you paid. You may not agree with me, but on a personal note, that’s how I looked at it.